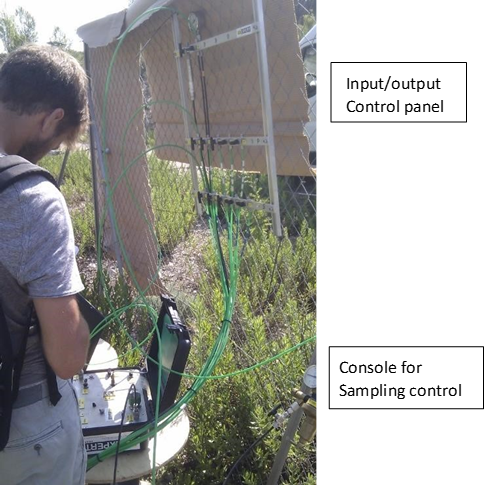 Deep monitoring of groundwater flows in karst catchments for the characterization of recharge and flux dynamics at different time scales. 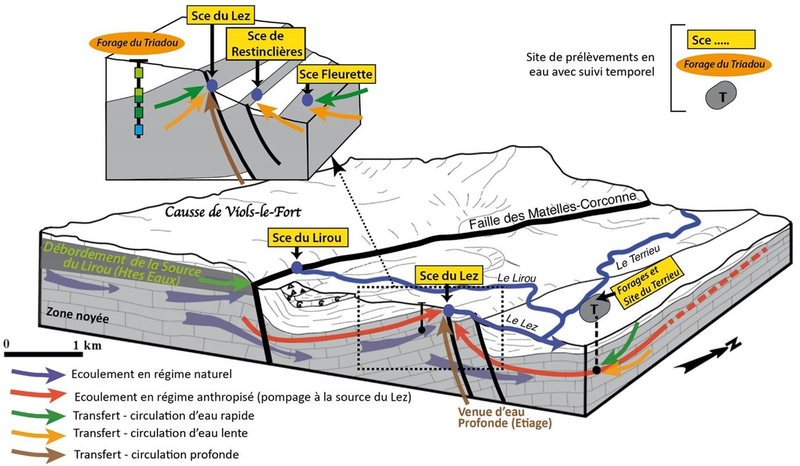 The 335 m deep CRITEX bore-hole (Forage du Triadou, Figure 1), strategically located 700 m north of a Mediterranean karstic spring (Lez spring) used to supply drinking water to the Montpellier agglomeration and 150 m south of the Lirou intermittent stream, was equipped with the Multi-level monitoring PMPS system (SolExperts ® ). This system complements the hydrodynamical and hydrochemical monitoring network of the multi scale observatory of groundwater hydrodynamics and flood dynamics in karst (MEDYCYSS observatory, SNO KARST, OSU OREME, IR OZCAR). On this hydrosystem, with the increasing water demand, significant research efforts have been set up to determine whether the aquifer could support a larger exploitation (increased pumping rate), and to assess the degree of vulnerability of the groundwater resource. water-filled regulating cylinder (Figure 5) prevents sudden variations in pressure in the packers. Each sampling interval is connected to the surface by an inlet capillary and an outlet capillary. The inlet line allows the injection of nitrogen, which then pushes the water contained in the sampling chamber to the outlet line (Figure 4). 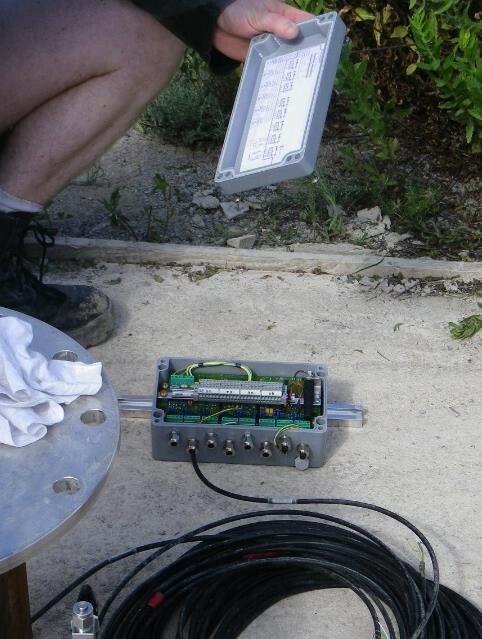 At surface, each input/output line arrives on a panel with valves allowing groundwater sampling on the chosen interval, all controlled by a console (Figure 6). The remainder of the borehole is PVC cased and each pressure / temperature sensor is connected to the surface to a Data Logger (Figure 7) allowing data to be recorded and retrieved manually and by GSM. On the CRITEX borehole, 6 intervals (+ 1 between the last packer and the surface) were isolated. 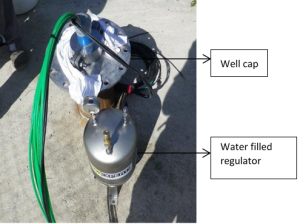 The Multi-level monitoring PMPS equipment (SolExperts®) allows pressure/temperature monitoring in different intervals isolated by packers and the sampling of groundwater by means of capillaries allowing pumping by overpressure of nitrogen in the sampling line. Since July 2014, five zones are continuously monitored with pressure/temperature sensors and groundwater sampling is carried out on 6 intervals. 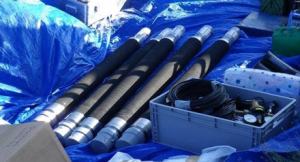 The data collected supplement the operational monitoring of the hydrodynamic and geochemical variations carried out within the framework of SO MEDYCYSS (drillings, karstic network, temporary and perennial springs). 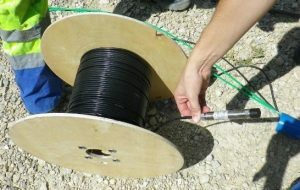 The objective of this monitoring is to identify the vertical structuring of the physicochemical variations of groundwater and to understand the contribution of the various compartments of the hydrosystem from the recharge zones to the main outlets, especially during extreme events at the origin of flash floods. This identification is of major importance for the understanding of vertical transfers and recharge mechanisms that control the medium-term availability of groundwater resources in karst aquifers. The physicochemical characteristics of the infiltration water, evolving from the recharge zones to the main outlets, are controlled by the residence time of groundwater in the various compartments of the hydrosystem. Compartments characterized by a short residence time can play an important role in the sudden increase of the flow of springs during periods of flooding, whereas those characterized by a long residence time are likely to support perennial flows during pronounced low flows. The coupling between hydrodynamic and hydrochemical characterization by the way of different natural tracers (major and trace elements, total organic carbon and fluorescence of Dissolved Organic Matter), bacteriological and isotopic tracers (stable isotopes of water and carbon, isotopes of Strontium and Boron) has allowed i) to characterize infiltration modalities and groundwater residence times in different compartments of the hydrosystem, ii) to specify the importance of the unsaturated zone in relation to the saturated zone in the flow organization and iii) to assess the vulnerability of this type of aquifer to anthropogenic contamination, in particular to assess the quality of the deep flows at the hydrological cycle timescale. Finally, the measurement of the pressure at different depths, allowing to obtain a vertical profile of pressures, makes possible to complete the understanding of the recharge processes, in particular during extreme events at the origin of underground and surface floods. The karst can contribute in a non-negligible way to the surface flows and participate in the genesis of these flash floods, causing significant damage in a perimediterranean context. Figure 8: Water depth in the Lirou river, precipitation and piezometric monitoring at the Lez spring and within the five compartments of the CRITEX Triadou borehole from July 2014 to Nov. 2016. Within this bore-hole, five compartments were thus isolated using packer system for the continuous monitoring and the manual sampling of groundwater. The data (Figure 8) show a consequent recharge and high interactions between surface water (when flow occurs in the nearby intermittent stream) and groundwater, particularly in the Valanginian upper compartment (n0, n1 and n2 levels on figure 8), considered as aquitard. 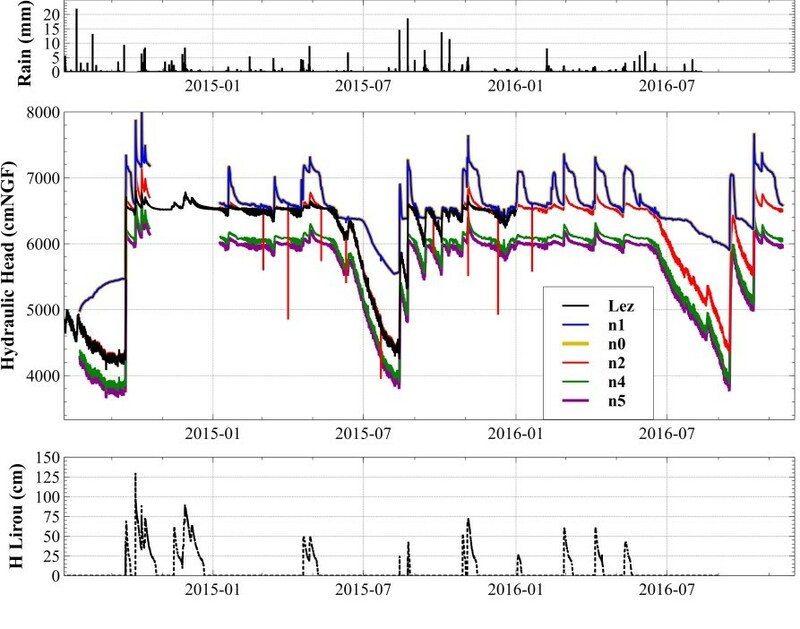 The continuous monitoring allowed identifying a fast hydrodynamic response on the different compartments, synchronous with the hydrodynamic behavior registered at the main karst outlet (Lez spring). On the contrary, the hydrochemical stability of groundwater highlights the differences between pressure transfer and mass transfer within the five compartments, pointing out slow groundwater circulation in the highly kartsified deep Berriasian-Kimmeridgian aquifer (n4 and n5 levels at -220 et 335 m depth respectively). 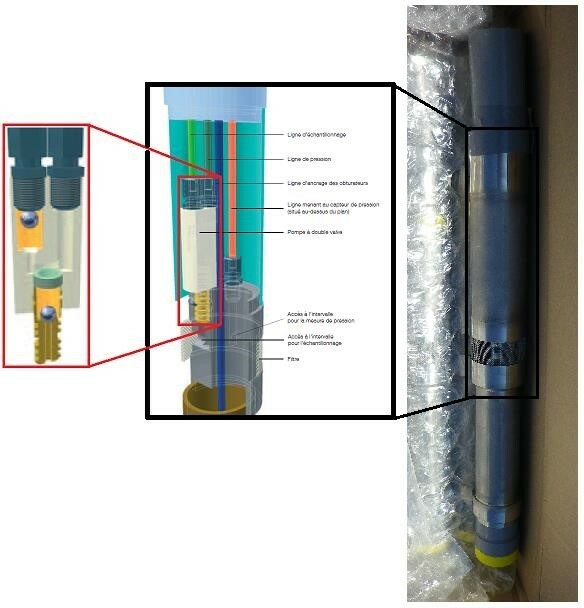 The head gradient between the deep compartment and the Lez spring monitoring indicates that groundwater located in these compartments are not directly drained by the main karst outlet, and that deeper circulations towards other outlets may exist. 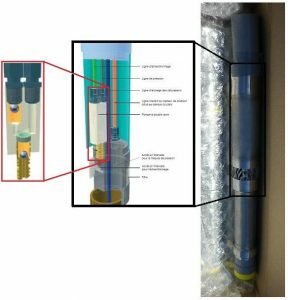 The monitored hydrodynamic behavior, together with the physicochemical measurements, thus show a highly capacitive behavior of the deep compartments, which is a major result to satisfy the increasing water demand. These results highlight the complexity and the heterogeneity of such deeply kartsified Mediterranean aquifer, but also the large interaction with surface water, especially during extreme events.